Background The optimal antithrombotic therapy after surgical bioprosthetic aortic valve replacement (BAVR) is uncertain. 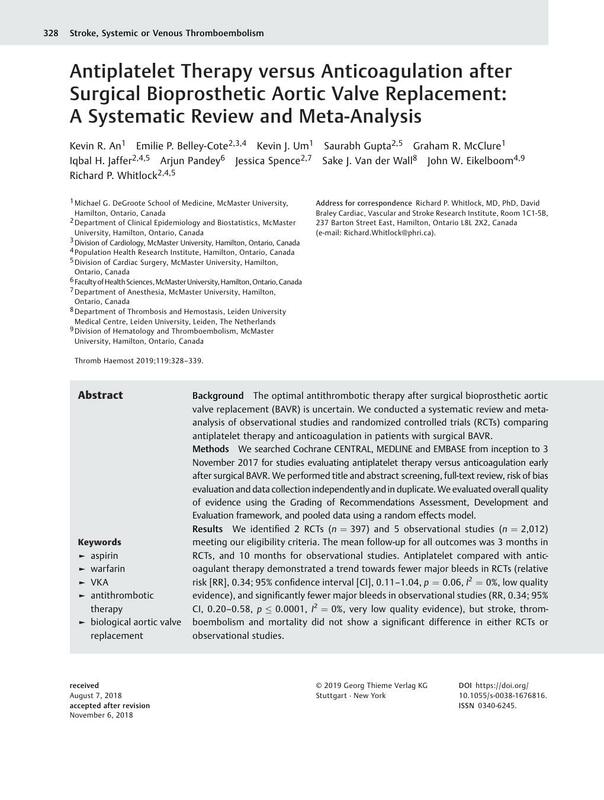 We conducted a systematic review and meta-analysis of observational studies and randomized controlled trials (RCTs) comparing antiplatelet therapy and anticoagulation in patients with surgical BAVR. Methods We searched Cochrane CENTRAL, MEDLINE and EMBASE from inception to 3 November 2017 for studies evaluating antiplatelet therapy versus anticoagulation early after surgical BAVR. We performed title and abstract screening, full-text review, risk of bias evaluation and data collection independently and in duplicate. We evaluated overall quality of evidence using the Grading of Recommendations Assessment, Development and Evaluation framework, and pooled data using a random effects model. Results We identified 2 RCTs (n = 397) and 5 observational studies (n = 2,012) meeting our eligibility criteria. The mean follow-up for all outcomes was 3 months in RCTs, and 10 months for observational studies. Antiplatelet compared with anticoagulant therapy demonstrated a trend towards fewer major bleeds in RCTs (relative risk [RR], 0.34; 95% confidence interval [CI], 0.11–1.04, p = 0.06, I 2 = 0%, low quality evidence), and significantly fewer major bleeds in observational studies (RR, 0.34; 95% CI, 0.20–0.58, p ≤ 0.0001, I 2 = 0%, very low quality evidence), but stroke, thromboembolism and mortality did not show a significant difference in either RCTs or observational studies. Conclusion Antiplatelet therapy demonstrated reduced bleeding risk with no negative effects on stroke, thromboembolism or mortality compared with anticoagulation therapy after surgical BAVR. Our confidence in the results is reduced by the low quality of the available evidence. E.B.C., R.W., K.A., S.G. and J.W.E. were involved in study conception and design. K.A., K.U., A.P. and S.J.V. were involved in data collection. K.A., K.U. and G.M. were involved in analysis of data. E.B.C., K.A., S.G., G.M., R.W., I.J., J.S., J.W.E. and K.U. were involved in drafting of the manuscript. All authors were involved in revising and approving the final version of the manuscript.